In John 18:1-27, John describes some of the important events that happened on the way to the cross for Jesus, namely, his arrest in the garden, his trial before Annas and his denial by Peter. However, John presents these in a way that helps the reader to understand that Jesus remain in complete and calm control of His destiny. The cross would not come about by accident but by His obedience to His Father’s will. Despite his good start, things began to unravel early on for King Saul. First came his impatient presumption when he offered the burnt offering sacrifice, then came his irresponsible decree when he banned his army from food, but to top it all of was his deceitful disobedience of God’s express command. There are many lessons we learn from his fall and in the end he does not point us to King Jesus who did all that God commanded him and whose fall on the way to the cross was only for a moment. When Samuel gave his farewell speech to the people of Israel, he had little idea that his ministry was far from over. Nevertheless, Samuel’s speech indicated that he desired to be remembers as a faithful servant of the Lord who had shown integrity of character, had truthfully spoken God’s Word and had prayerfully upheld his people. God, however, had more work for Samuel to do and would not let this godly man’s influence simply disappear. Samuel’s faithfulness stands as a prelude to the Lord Jesus who would come and be faithful in completing all of God’s will for His people. Easter is coming…we’re getting ready! When Saul was anointed by Samuel as King over Israel it was evident that he had physical features and character traits that all promised hope that he would be a godly leader of the people. Accordingly, Saul began well in many areas without the help of other past kings to guide him in that difficult task. However, Saul’s good beginning amounted to nothing. Believers are not just to be those who begin well but also finish well, using the gifts and opportunities that God gives us until the final Day. These verses describe the request of the people of Israel to Samuel that he appoint them a King. Although this request displease Samuel, God allowed the request to stand. He had already told the people of Israel of His standards for a king and could also see the motives behind their request. The people wanted to be just like ‘the nations around them.’ Thankfully we have a King in Jesus who is the True and Perfect King, One whom we did not ask for but were given because of grace. Our daughter Church plant, Reforming (officially, South East Bendigo Presbyterian Church), has a new home, and thanks be to God, it’s the home we’ve always wanted! 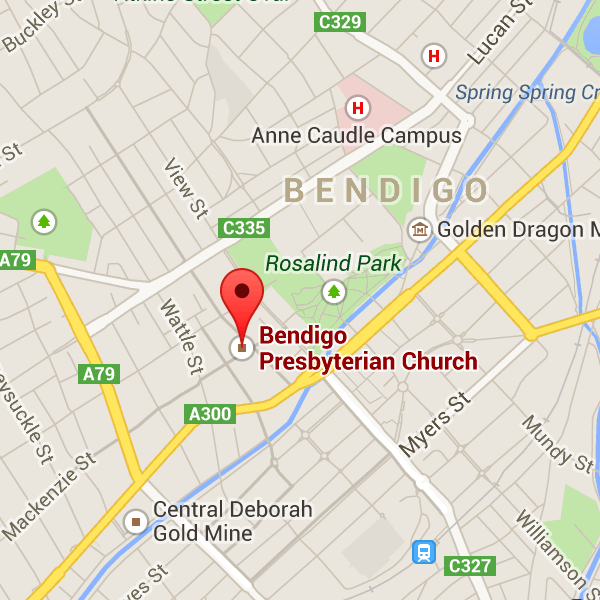 As of Sunday March 2nd, 2014 we’ll be meeting in the Performing Arts Auditorium (P3) of Bendigo South East College (BSEC) which can be found in Ellis Street, Flora Hill. Join us at 5pm each week!